Ahoy there! Join this crew of pirates on a high-seas quest for treasure. These salty dogs are off to fetch some gold, and no whale, skeleton, or thunderstorm can stand in their way. But our brave buccaneers best beware―there may be even more trouble ahead! 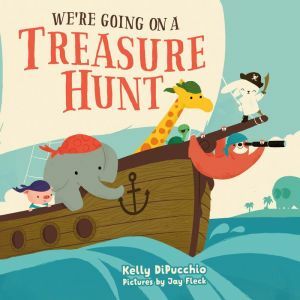 With Kelly DiPucchio’s fun, rhyming text and Jay Fleck’s bright illustrations, We're Going on a Treasure Hunt is a rollicking read-aloud perfect for little adventurers.